Please note that the November 18, 2014 General Meeting has been cancelled due to impending weather conditions. It has been rescheduled for Tuesday, November 25th at the Dorian Parker Community Centre, 227 Sunnidale Rd, Barrie. We hope to see you all then! Welcome to our Photography Night and Annual meeting on Tues. Nov. 18th at 7 pm at the East Bayfield Community Centre, 80 Livingstone Street East. The building can be accessed from Stanley Street just east of Bayfield St. off Livingstone St. East. Park at the front of the building. We are in one of the rooms to your right as you enter. There were over 50 photographs entered in our competition this year, and they will be on display for everyone to enjoy that evening. We know you will appreciate the beautiful rose photos of this past summer–seems so long ago now, doesn’t it? Also, part of the program will be you, our Members, sharing the “Joys of the 2014 Garden”. So cast your thoughts back to those lovely days and evenings you spent among the roses, in your own garden or someone else’s. Often we talk about the problems we have, but this time we are asking you to share happy thoughts. Our Annual Meeting will be very brief and then we will have the rest of the program. Refreshments will be cookies and juice, so if you like a hot beverage, bring it with you. There are no taps or sink in these rooms, so making tea/coffee is very difficult. ANNOUNCEMENT! Renew your HRS Membership! For the Year 2015, Memberships will be available for renewal / sale at the Nov. 18th General meeting. Please complete the Membership Form at the end of this Newsletter. The Rose Show and Members’ garden visit: locations have not been decided yet. They will be announced as soon as possible. HRS Christmas Cards — We have a few for sale with a photo of a Member’s rose on them, available at our meeting. There are always year-round greeting cards for Sale at our meetings of Members’ roses. Cost is $3.00 each or 2 for $5.00. Thanks go out to all Members who helped out on any Committees or other jobs on behalf of the Society during this past year. We thank the Board Members who are retiring for the tasks they took on and look forward to seeing them at our future meetings. As your retiring President, I would personally like to thank you one and all for helping me out on my 2 years as your “recycled” President. It has been a pleasure to meet with all our Members as we shared our love of roses and worked side by side on our various projects and meetings. Photographic Competition – At our November meeting, the judges will give us their results from the submitted photographs. Last Chance! The beautifully framed botanical painting of the rose “Tiffany” is available for you to acquire just by putting the highest bid on our Silent Auction at our Nov. 18 meeting. This will be the last chance to bid on this lovely painting that was generously donated to HRS by the artist Cherin Harris-Tuck of Barrie to help pay for the new signage at the Memorial Rose Garden. It will go to the highest bidder that night. What a wonderful Christmas gift it would be for someone special, even perhaps, for you. Jeanne Leong: My favourite rose from this season has to be our L.D. Braithwaite. It has been blooming almost continuously over the entire summer and into the fall. In fact, it has two very strong, colourful blooms, even today (Nov. 3). The plant receives lots of sun, and, being situated next to a stone retaining wall, benefits from re-radiated warmth into the evening and overnight. Ellen Spencer: My favourite this year was Emily Carr. She grew very tall and bloomed profusely. Ina Mechlinski: I like my rose “Seafoam”, a white shrub rose, hardy to zone 4. It is the best this year. It still wants to bloom. Bred 1963 in USA. Dale Lovering: My favourite rose this year was ‘Black Jade’ – a miniature which is the darkest rose that I grow. Linda Peacock: The 1812 Rose is fast becoming my favourite rose. It has bloomed constantly all season and still is blooming now. It has not been eaten by anything or shown any black spot. Edna Caldwell: So hard to decide. I think my favourite roses is “Floral Fairytale” , a lovely soft amber colour, very full, shiny foliage and more compact than many of the FairyTale series. Karen Shamas: It withstands anything nature does to it, has a gorgeous scent, a deep, red colour, little disease and blooms repeatedly. My favourite rose is the Rosa Rugosa Rubra. How can I keep track of which plants have done well in my garden versus those which have not? Is there a method or system for doing this that you would recommend? Yours truly, Perplexed about planning. I’ve found that keeping a journal of my planting, pruning, watering and fertilizing practices has helped me to be a more successful gardener. In a notebook, or, using a monthly calendar, document your daily, or weekly, gardening activities. One can record as many or as few details as one wishes. Include, for example, data on the temperature and weather, so that you can remember frost and rainfall information. Another suggestion is to take regular photos of your garden to serve as a visual reminder of how well plants have thrived. You could write down when pruning and fertilizing were done so that plants don’t get cut back or fed more than they should. Another option is to make note of causes for concern: insect damage, lack of plant blooms, or wilting. In sum, regular record-keeping will allow you to review, at year’s end, what worked and what didn’t. You can use your gardening record book as the basis for choosing new plants, deciding where to plant, and repeating those cultivation techniques that resulted in success. •	Are you interested in various aspects of gardening? •	Are you a newly-retired person who has dreamed for years of spending more time gardening? •	Are you new resident of the Barrie/Simcoe County area? •	Do you enjoy others’ roses but think you can’t grow them in these parts? Or that they are too much work? •	Perhaps the Huronia Rose Society would be of interest to you. •	We have speakers on general gardening topics as well rose-growing . •	We share information on the easiest roses to grow, that are disease and insect resistant so they require minimum care. •	Our Members’ Garden Visit has proved to be very popular, a social event to get to know each other better. •	We do have a rose show at the end of June where one can see roses one may want to grow. and ideal to our climate. Sept. 16 and Nov.18, 2014. Directions – If coming up Bayfield St., turn right onto Livingston Street, then left at 2nd set of stop lights at Stanley St. The entrance to EBCC is just a short distance along Stanley Street. If you are coming into Barrie from the east, take the Duckworth St. exit, continue ahead onto Cundles Rd. (that area is under construction). Turn right at the first stop lights – Livingston St., continue over St. Vincent St. Soon Terry Fox school will be on your right, EBCC is the next building. The driveway between the school and ECCS can be taken into the parking lot. Park in the front parking lot and the meeting room is to your right as you enter the lobby. We moved our meeting venue because the city is charging $3.00 per hour for non-residents all around the waterfront. September 16th from 7 to 9 pm. A “Question & Answer” follows the featured speaker of the evening, socializing over refreshments, wrapping up with Lucky Draws. Gloria is a retired teacher, a member of the Canadian Rose Society and of Greater Toronto Rose Society, a CRS Rose Judge and a District 5 Assistant Director of The Ontario Horticultural Association. Her digital presentation will feature many of the Fairytale and Vigorosa roses from Germany, that the HRS has been selling recently, as well as other kinds. She asks that members who have Fairytale or Vigorosa roses in bloom to please bring them for a ‘Show and Tell.” If you have any other beautiful roses in bloom, bring a few along, too. Please remember to include the names of the roses. 	Awards and Trophies from our June 24 Rose Show will be presented that night as well. Photographic Competition – this evening is the deadline for submitting all those lovely photos you have been taking of your roses and gardens all summer. They are to be given to the chairperson, Janice Schmidt, with your name on the back and an entry tag attached. There will be extra tags on hand that night, so come early if you need time to fill them out. Then at our Nov. 18 meeting, we will see the results of the judging. Painting of a beautiful rose from Ligita’s garden has been donated to our society by the artist, Cherin Harris-Tuck of Barrie. We are conducting a Silent Auction at this meeting and the Nov. 18th meeting. Save up your dollars so you can make several bids on this wonderful rendition of a pink Hybrid Tea with a gold base, called “Tiffany”. These awards will be given out at the Sept. 16 meeting and perhaps some photos taken at the show will be seen. Memorial Garden – We thank the volunteers who helped with any and all jobs this year. We did have a nice number of volunteers, but more are always welcome for next year. We hope to resolve the issue of parking fees for non-residents by next year. Nominations – As of the annual meeting of the HRS on Nov. 18th, we say a big “Thank You” to Linda Peacock and Dale Lovering who have decided to take a step back from serving on our Board of Directors for the time being. They have both acted in many capacities, especially each as President. Also, Marilynn Forbes, who has been a Director for 2014, will retire from that position because of her other commitments. We appreciate all the work these folks have contributed to the betterment of the HRS. Therefore, we need some new blood (so to speak) on our Board of Directors for 2015. If you are interested to be more involved, speak to Linda Peacock, Ellen Spencer or myself, Edna, at our Sept. 16th meeting. When coming onto the HRS Board, you serve in the area you that interests you. You may also get a telephone call from one of the three of us if we are still looking for more volunteers. 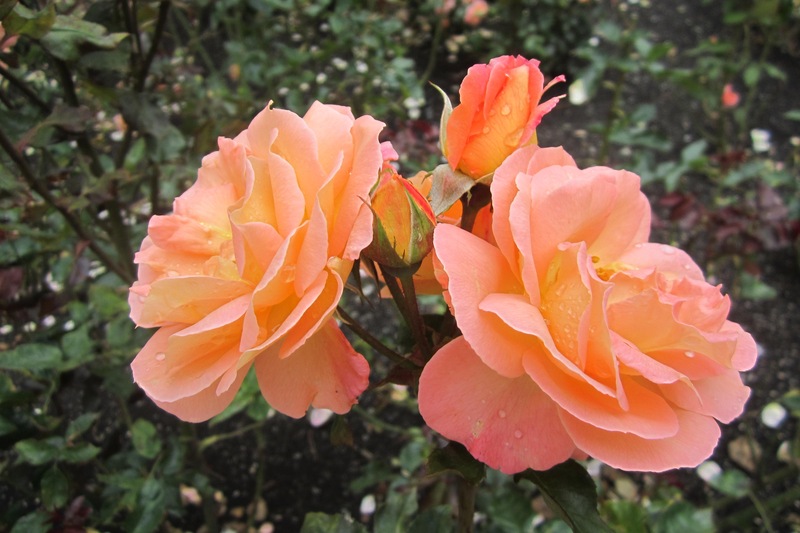 Joyce Fleming of Grimsby, a hybridizer of Canadian roses for many years passed away this summer. Her most loved rose is Roberta Bondar, a yellow climber. She attended rose conventions in many countries and judged many rose shows. Her gentle manner and lovely smile will be missed by all who knew her. One of my rose beds is in too much shade now and tree roots are filling the bed. Even tho’ it is not a good time of year to do so, can I move them to a better location now? Where would I buy some more at this time of year? If your roses are just not growing or flowering, and seem to be even getting weaker, then, yes, it is possible to take a chance to move them mid-summer, although normally it would not be recommended. Prepare the new bed with good soil containing compost, and choose a cool day when showers are predicted. Try to lift them with as much of the root system intact as possible and water well each day, unless there is rain, until they don’t show signs of shock. REMEMBER! The NEW MEETING LOCATION for HRS meetings for Sept. 16 and Nov.18, 2014 will be at the East Bayfield Community Centre, 80 Livingston Rd., Barrie ON East of Bayfield Street. As of July 2, 2014 the City of Barrie implemented parking fees for non-residents at the South Shore Community Centre. To avoid adding this expense to some of our members we have changed our meeting place as of the September 16th meeting and forward. Our new meeting place will be the East Bayfield Community Centre, 80 Livingstone Street E, Barrie. If you follow Livingstone Street to behind the Georgian Mall, turn left onto Stanley Street to enter the parking lot immediately on your right.